UNITED NATIONS (AP) -- The United Nations and the International Olympic Committee signed an agreement Monday to use the power of sports to promote peace and economic development, a move that strengthens collaboration between two of the world's major organizations. IOC President Thomas Bach told a U.N. event celebrating the strengthened relationship that U.N. Secretary-General Ban Ki-moon was right when he said "Olympic principles are United Nations principles." He pointed to the U.N. and Olympic charters, which both call for international cooperation to promote peace, a better life for people around the world and preserving human dignity. "Yes sport can change the world but it cannot change the world alone," Bach said. "When placing sport at the service of humankind, we need and we want the partnership with other players in society." 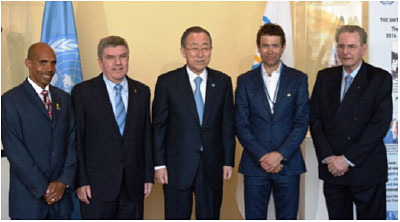 Secretary-General Ban said the Memorandum of Understanding signed with the IOC was "a logical and historic step after years of ever closer collaboration in using sport to promote development and peace." The agreement calls for joint sporting initiatives between the IOC, national Olympic committees, international sports federations, organizing committees and international athletes and the 193 U.N. member states, U.N. agencies, envoys and goodwill ambassadors. The two organizations will be promoting education for youth through sport without discrimination of any kind, access to sport for all communities especially the most disadvantaged and marginalized, healthy lifestyles and peace-building and community dialogue. The secretary-general announced the appointment of former IOC president Jacques Rogge as his special envoy on youth, refugees and sport - and welcomed the presence of Boston Marathon winner Meb Keflezighi, who came to the United States as a refugee from Eritrea at the age of 10.